REVIEWER'S NOTE: There have been a number of revisions of Baxter's since this review was written. 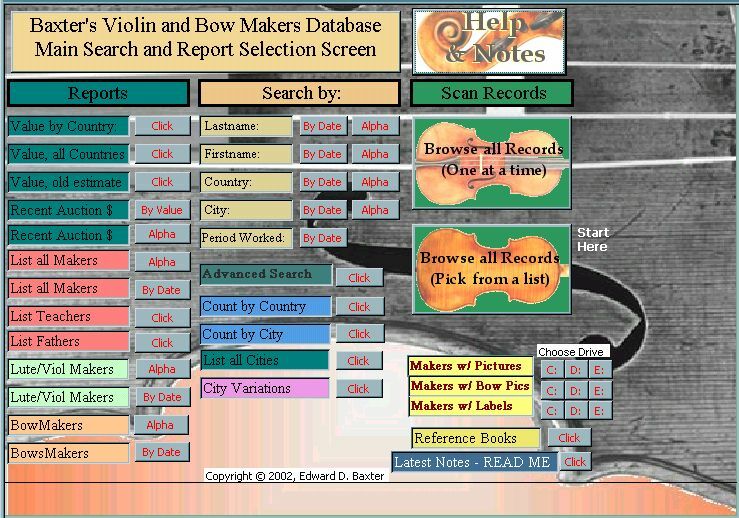 Baxter's Database is a terribly useful compilation of information gathered from many of the standard resources of violin making history, including encyclopedias, dictionaries and other histories, as well as auction catalogs and internet resources. There are well over 18 thousand entries covering makers from the earliest viol and lute makers of the 13th century, to recent makers from the US, Europe and Asia. There are even a few (71) references to trade names, i.e., violins and bows manufactured under a fictitious corporate name (nom de lutherie?). The databases are supported by a Microsoft Access Runtime engine - basically a self-supporting Access database that doesn't require the separate installation of the Access program. If you are familiar with Access, the interface will seem familiar, which would be good because otherwise you will find it pretty awkward. The advantages to having these resources compiled in a database format are obvious and great. There are few libraries that have as many source books as this database has used. And once you get the hang of the interface it is really quite powerful, allowing you find interesting data in many ways very easily. Products, listed as "Instruments" to cover any violin family instruments, otherwise labeled "bows", "viols", or "lutes"
Models, i.e., the general style of instruments made, such as Strad, Guarneri, Amati, Stainer, French, Italian, etc. Valuations - Taken from various standard indexes and catalogs over the last century. This is useful in noting the progression of valuation over time. Recent additions are taken from auction catalogs and similar compilations. It should be clearly understood that very few records actually contain all of this information. In many cases the data is very fragmentary. This database is by no means exhaustive or comprehensive of the field. In addition to the raw data, Baxter has added to his current edition (ver.2.6) a collection of related images, also from the standard references. These include both color and black & white photos of example violins and bows from many of the makers in the database. Since the database structure cannot contain graphical images itself, they are accessed by clicking on a button for the drive where the database files are located (by default, this is the CD-ROM, but they can be copied to the root directory of the C: drive). When an image is called the program boots the Windows default image viewer for the JPEG image type. This and other quirks of the program's interface are minor annoyances. The interface could be cleaned up a lot and the user help file could stand to be fleshed out. While not too difficult to figure out, a lot of operations are not intuitive for anyone not accustomed to doing Access queries. For example, when using a search box to enter a search term, you need to enclose it in wildcard characters (* ___ *) or it will only find records with the literal search term and nothing else. He adds parenthetical information in many fields that would exclude relevant records from a literal search. The ability to do search queries and to sort lists in various ways can yield interesting information that you would not otherwise glean from a printed index. This is the real value of the database. Ed Baxter is a serious amateur violinist who undertook this project over a period of four years as part of his own search for violin information. His intention is not to replace the standard literature on violin history, but to make it more accessible. Baxter has added nothing new to existing research, but has made the existing data much more accessible. This reviewer is not entirely comfortable with Baxter's wholesale extraction of data and images from copyrighted sources as this could become a legal liability for both the compiler and his customers. I have expressed my concern about this issue to Baxter and he seems to feel secure that he has used nothing that is not in the public domain. I simply offer this as a caveat to my readers. 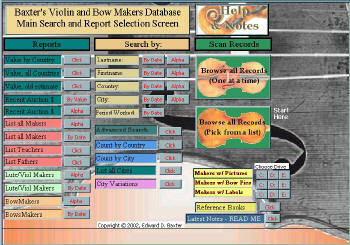 Baxter's Database of Violin & Bow Makers is available direct from the publisher through his website at WWW.VIOLIMAKERSDB.COM. The cost is $64.95 + $4.00 shipping. Disclosure: I have received a review copy of the product, but I have no other interest in or relationship with the publisher.